visit Timotesubani monastery near Borjomi - presumably founded by Shalva and Ivane Akhalcikeli, rulers of the historical region of Tori, The mural paintings at Timotesubani are among the best examples of Georgian medieval art. They were executed in the first half of the 13th century and belong to the so-called “epoch of Queen Tamar” revealing characteristic features of the new decorative dynamic style. Borjomi is one of the main balneology and climate health resorts of Georgia. At the alt. of 810 m and at the distance of 160 km from Tbilisi, it is a part of the ravine covered with forests. Crystal-clear air, warm summer (+19 C), mild winter (-3 C) made Borjomi famous since XIX c.
dinner and Overnight in Vardzia at the guest house. Drive to Samckhe region, visit Sapara - Sapara monastery complex, perched on the edge of a cliff, already existed in 9th century, but was expanded by the Akhaltsikhe governors Sargis and Beka Jakeli. The complex consists of churches of St.Saba, St. Stefane and The Assumption of Godmother. Then visit centre of samckhe city Akhalcikhe with new reconstructed imressive citadel Rabati - with its multicultural architecture, is well worthwhile. This district is on a hill on the north side of the Potskhovi, just west of the bridge. Rare examples of darbazi (traditional Georgian houses) cluster around the castle, which was built in the 12th century and houses a mosque from 1752 and the ruins of a medrese (Islamic school). The rabati also has a synagogue, an Armenian church and a Catholic church, shops,restaurant, main tower, small pools,fountains and fantastic views for taking photos. Overnight in Akhalcikhe at the guest house. Drive to Inner Kartli and visit city Gori with ancient pagan city Upliscixe in caves with basilica. On the way back you be able to see Samtavisi - The present Samtavisi cathedral was built in 1030 by Ilarion, the son of Vache Kanchaeli, the bishop of Samtavisi. The church has been extensively damaged over the centuries. Its original face is mostly preserved on the church’s Eastern facade. Drive to Lower Kartli on the way to Bolnisi you will taste acidic water and Churchkhela; (made with wine juice and walnuts). visit Sioni church in Bolnisi , it is the biggest Georgian temple in the form of a basilica in Southeast. (V-in) one of the most ancient inscriptions are found In the temple in the Georgian language. Tsugrugasheni's church. located at top of the mountain which is known with an ornament and the Dome was included into UNESCO List. Around very beautiful nature. The name designates “God's way”. It is constructed at the beginning of the XIII century. At the end of the tour we will visit Dmanisi - the most ancient City is located on Mashaver's river. The city existed since the V century, here you can see gate, paved streets, baths, dwellings, wine cellars and basilica and museum with ancient humans bones. price includes: Hotel accommodation. 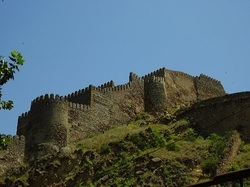 Tbilisi 1 night at the hotel 3*, Vardzia 1 night at the guest house, Akhalcikhe night at the guest house. entrance tickets in Vardzia Historical - Architectural Museum - Reserve; Rabati castle; Gori Stalini's house museum, Upliscikhe - Historical-Architectural Museum-Reserve, Dmanisi museum-reserve.